At our July monthly meeting a new executive council was introduced to the guild. These guild members will be in these positions until June 2013. Each of the vice presidents have committees of guild members working with them to help create a valuable experience for members of the Austin Modern Quilt Guild. The Austin Modern Quilt Guild wants to get more people involved in meetings! In an effort to do that, we would like every one who attends the August meeting to bring one jelly roll strip of fabric, to be entered in a giveaway. All the jelly roll strips will be collected at the meeting, bundled together, and then given away in a drawing. For every jelly roll strip you bring, you get a ticket in the drawing, with up to five entries. If you bring one jelly roll strip of fabric, you have the opportunity to win a jelly roll bundle! If you bring two jelly roll strips of fabric, you have twice the opportunity to win a jelly roll bundle! If you bring 5 strips, you receive 5 entries. However, if you bring 6 strips, you will only receive the maximum of 5 entries. What kind of strips to bring? 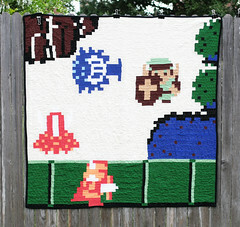 Since the QuiltCon Block Challenge entries are due on August 15th, the Guild wants to promote more entries. 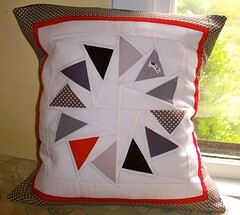 Please bring a SOLID or PATTERNED quilt store quality fabric in a QuiltCon color. 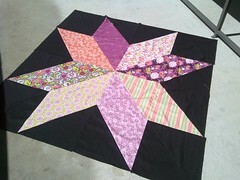 The August meeting is August 9th, so winners will still have a few days to make and mail a block, before the due date. So, look in your stash... do you have a piece of fabric in QuiltCon colors that could be used? If not, you can purchase a 1/8 of a yard at a fabric shop, and slice it into a 2½" strip. A jelly roll is a 2½" x 44"strip of fabric. Manufacturers sell pre-cut fabrics (charm packs, layer cakes, jelly rolls, fat quarters) to allow customers to purchase the entire fabric line, in a certain fabric cut. Fat Quarter Shop is an example of an online store that caters to pre-cut merchandise. 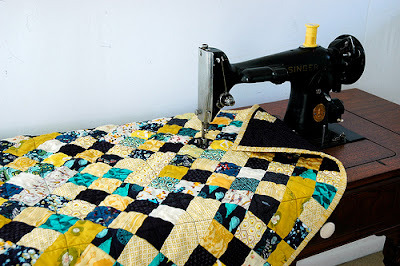 If you are looking for a project to make with your jelly roll bundle, besides a QuiltCon Block Challenge entry, check out Gina Pina's Jelly Roll Challenge Quilt she shared at the June 2012 meeting. Or you could make a Postage Stamp Quilt or a Double-Hour Glass Quilt. Look at the jelly roll recipes at Mode Bake Shop for more ideas! Will there be more Jelly Roll Drawings at the meetings? Yes, we plan on doing jelly roll drawings at future meetings! The fabric theme at each meeting will change, but we plan on doing more jelly roll drawings. Bring a solid or patterned 2½" x 44"strip of fabric in a QuiltCon color to be entered in the drawing. Please only bring quilt store quality fabrics. Each fabric strip entry gives you one ticket in the drawing, for a maximum of 5 entries. If you bring multiple entries, do not repeat fabrics. Drawing to be held at the August 2012 monthly meeting. We hope to collect enough jelly roll strips to give away two bundles! Join us for our July monthly meeting, which will be held Thursday July 12th from 6:30-8:30pm at Remnants: fiber[culture] (10435 Burnet Road, Suite 106). Don't forget to bring a chair! Election of 2012-2013 officers. To vote you must be a paid member of the guild. QuiltCon. The QuiltCon schedule is out! There is a handy-dandy PDF available for download, which lists lectures, workshops, locations, and pricing. If you plan on buying any tickets, you will want to be a paid member of the guild, as paid members get discounts! Show & Tell. Bring a project you are working on or have finished to share with the guild. Block Swap. This is the last month of the Block Swap. Be sure to bring your charity blocks! Demonstration! Guild member Gina Pina will doing a pouch demo, in anticipation of the August Pouch Swap. Starting at the July 2012 meeting, attendance at guild meetings requires paid membership. Attendance at the first meeting is free. Attendance at the second meeting is $5. Attendance at any other meeting requires dues to be paid in full. Questions? Read more about membership, By-Laws, and Rules & Regulations here. Last but not least... Remember to bring a chair!